[By Nick, 2015-2016] Welcome to another installment of Friday Night Fights, a fight I'm not too excited about actually but since I had a free sample of this new Perry's flavor, I wanted something to compare it to. Now, not only do both of these German Chocolate Cake flavors have shredded coconut, neither of them have any real chunks of cake. 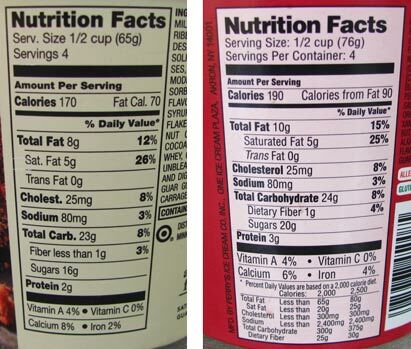 Instead, one contains pecans while the other contains chocolate chunks. This shall be an interesting fight for sure. The rounds will be appearance of the ice cream, mix-in quality and then overall flavor to finish this fight. 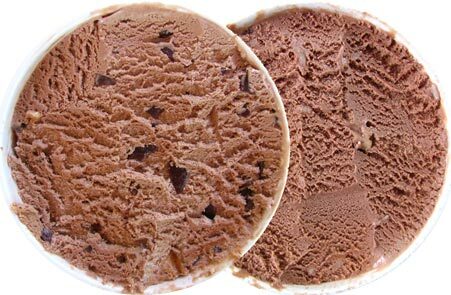 (Target) Archer Farms version is chocolate cake flavored ice cream with coconut caramel swirl & chocolate flavored pieces. 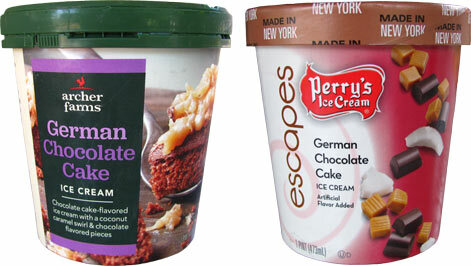 Perry's Escapes version is chocolate cake ice cream, coconut shreds, pecan pieces, and rich caramel sauce. Appearance: Both ice creams look very similar from the get go. It's actually quite amusing just how similar in color both of these ice creams are. Scooping down reveals a different picture. While you can't see the caramel swirl much in either flavor, it's quite easy to see that Archer Farms‎ isn't messing around with the mix-ins. There's a ton of them while Perry's is slacking when it comes to the amount of the pecans. This round easily goes to Archer Farms. 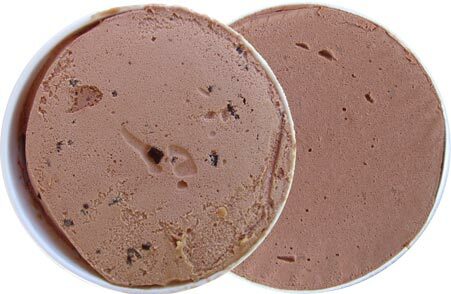 Mix-in Quality: ‎Besides the base being chocolate cake flavored, these ice cream don't share the same exact mix-in components. Archer Farms uses a coconut caramel swirl and chocolate chunks. Perry's on the other hand uses a caramel sauce and then coconut shreds and pecan pieces. Like I mentioned in appearance, Archer Farms is loaded with chocolate chunks. You can't get a spoonful without one in it. It's not super cheap chocolate either like you'd expect from a store brand. The coconut caramel swirl is missing visually but I can definitely taste it. The coconut flavor is on the natural side without any sort of sun tan lotion qualities. The caramel is pretty irrelevant in flavor. If anything, it adds a buttery component. Only problem is that the coconut shreds are noticeable even with all the chocolate. It's not too off putting but I'd be much more happy if they were gone completely. Perry's suffers from the same coconut shred problem but it's more apparent here. The pecan pieces aren't prevalent enough and don't do much flavor-wise either. Thankfully the caramel sauce here isn't dominating. It's more sweet than anything but it helps distract from the dominant coconut flavor and texture. Once again, Archer Farms take the round. 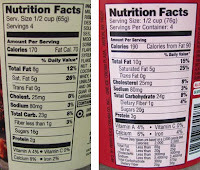 ‎Overall Flavor: Archer Farms has the dominate lead, but let's see if Perry's has something left in the tank with the flavor combination. Archer Farms' chocolate cake base doesn't taste like chocolate cake. It actually tastes more like chocolate frosting and I have no problem with that at all. This is one of the better flavored chocolate bases I've had in awhile. The mix-ins compliment it as well. The chocolate chunks add more of a bitterness to the sweetness of the base. The coconut adds a complimenting flavor albeit a terrible textural addition and the caramel rounds things out with the butteriness. Perry's does in fact nail the chocolate cake flavor in their base. I have to give them that. If it wasn't for the lack of texture, I'd think I was eating chocolate cake. The pecans flavor is there in spurts when you get a decent sized one but that's not all that often. The combo of caramel and chocolate is always a great combination and it works well here. If they stopped there and called it a chocolate turtle ice cream, this flavor might've been better. However, they went and added the shredded coconut and that just ruined things from me. From the overpowering taste to the off putting texture, I'm just not a fan of this flavor. I'm sure people who love coconut will enjoy it but I'm not that guy. The round and the flawless victory goes to Archer Farm. I know you guys love our FNFs. In the comments, feel free to recommend products we've yet to review that can face off against each other. Who knows, maybe your recommendation will become a fight in the future! Interesting Nick even Archer Farms has less calories. They win on that front too! I would love to see the face off between Ben & Jerry's Walmart exclusive Cotton Candy Ice Cream and Great Value's brand (Walmart) Cotton Candy Ice Cream! I've tried the Great Value version and LOVED it, so I would love to see how Ben & Jerry's compares! Wanna have your mind blown? Ask someone from Germany if they like German Chocolate Cake. They've probably never heard of it, since it's an American cake invented by a guy named German. Then ask yourself why you never questioned where Germans got all these coconuts. The coconut's tropical, and Germany is in a temperate zone! So Nick I'm confused. It's called German Chocolate Cake. One of the key components of GCC is Coconut. I understand if you don't like coconut, but you seem to be bashing the flavor because it has shredded coconut...that's a PLUS, not a negative. Josh, I remember hearing that story before. Always funny. ibagioalie, that is true but from the gcc's I've had, the coconut has been toasted making it no long have that texture that I'm not fond of. That and the coconut never really dominates in the cake. It plays a supporting role to the chocolate and caramel.